Use the rich alcoholic damsons as a pudding, with cream, or as a cheesecake topper, and don’t drive afterwards! This time of year I freeze quite a few damsons and make this up when I have the time later, no need to even defrost the damsons! Damson Gin or Damson Brandy will obviously store for as long as you can resist drinking it. If using fresh damson fruit I’ve been advised to prick their skins otherwise the stone inside can develop toxins!?? Do you know if this is true? Hi, no you don’t need to stone them, and apparently if you want to consume the fruit after removing the liquor, the stones will pop out quite readily when squeezed gently. Interesting! Have never heard of the toxin issue. You can fork the skins which allows the juice to escape more easily, and of course helps to prevent the fruit from splitting if the oven is a bit too high.I always wondered if the mould that sometimes occurs is just a seasonal thing relating to that batch of fruit, but once its spooned off it tends not to re grow, and there’s no mustiness in the remaining fruit, so we carry on eating it…. yes they can produce toxins as they can get mouldy during the firmenting process if they aren’t pierced or cut this is info from my husband who’s mum has been making it for a very long time! Just made my first bottle – roll on winter !!! 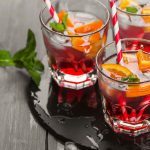 Can anyone tell me me – can you use Vodka instead of Gin/Brandy and what quantities of sweet damsons to spirit/sugar are recommened? I have 2 jars made with vodka but am waiting for Xmas before I try them….. will let u know! I grew a damson tree on my allotment.They are large ones so I do de-stone them, put them in a demi-John and a couple of chillies and a bottle of London Gin.Shake it all up and leave it for a few weeks swirling it about now and again then left to settle and clear. After which I decant it back into the gin bottle sampling on the way.The colour is beautiful the flavour delicious and it beats Bacardi equivalent hands down. Nice and warm. Don’t over do the chillies. ps you put the chillies into any drink non alc or other for a warm refresher! I made 6 batches of damson gin last year plus 1 damson brandy, 1 blackberry brandy and 4 sloe gin, all been opened for tasting last week and the flavour and aroma are just fantastic much better for leaving to mature, but I did remove the fruit after 16 weeks. Any fruit and spirit can be used it`s all part of the fun in making your own. I decorate in small bottles, gift wrap and use as presents. I took a bottle of damson gin to a women’s meeting and gave each member a shot of same. I wanted them to say whether the recipe could go into a special new recipe book The meeting was a very cheerful one and members felt they would probably need to taste it again at the next meeting before making a final sdecision. We shall see! 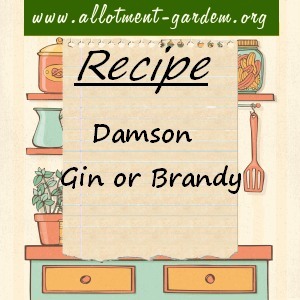 Damson gin is very easy to spoil by putting too much sugar in the mix in the first place. You cannot take sugar out of a solution, but you can add it in afterwards. Use a washed plastic 2 litre lemonade/water bottle. After time, the resulting liquid will start to darken and mature. The longer you leave it the better it tastes. It will not go off as the alcohol and sugar act as preservatives. If you start in September, it will be good by Christmas. When you are ready to serve/bottle/make presents, have a taste. It could be too tart at this stage, add sugar to taste. It will continue to mature in the bottle. You dont need expensive kilner jars, bottles and paraphanalia. Damson’s are plentiful in Auckland Vicki. Last season a person left 10 trees unpicked that I know. 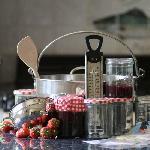 I have been making Damson Gin now for three years as Sloes are unavailable in New Zealand. I have followed an old Sloe Gin recipe where you pierce the skin with a wooden toothpick. Maybe it is an ‘old wives tale’ not to use any metal to pierce the skin – who knows? I have added brown and white sugar – not in the same bottle and cloves and cinnamon stick. Interesting flavours. The Damsons mature in February March in Auckland so now is my time to collect Damsons which I get from an orchard out Glenbrook way (for those that live in Auckland). What different recipes there are! Here’s mine. Very, very simple. 1 lb damsons, frozen or fresh, skins pierced lightly. 1 pint gin. Multiples of these quantities. Tried cheap gin, and better quality. Better quality is better! Put all ingredients into jar and agitate once a day for about 6 weeks. Let settle and filter/sieve into suitable bottles. You can of course play about with the quantities to suit taste. PS.Tried the “mush” residue as pie filling and was not impressed! Had a few pound of damsons in the freezer which unfortunately broke down today and the damsons have defrosted! Can I still make damson gin and jam from these?